The last issue of 2015 hopefully indicates a rising sensitivity among researchers to what patients think. An array of articles on the perceptions among trial participants of what a clinical trial is; of how best to break the news of a dreaded ailment to patients and their relatives, and of how committing a medical error affects the young intern or resident, could be some signs of this. Two authors explore the dilemma of dealing with appeals for faith healing to be allowed along with modern treatment. Another outlines the role of spirituality in clinical practice and healing. Along with the old problems come the new ones, such as those posed by internet psychotherapy with its alluring convenience, balanced by the possible threats of loss of privacy and misrepresentation. Interestingly, these articles reveal that the same challenges faced in India also trouble Nigeria, Iran, and Sri Lanka. Indians are proud of being called the “pharmacy of the world”, for providing essential medicines at a fraction of international prices is no mean feat. A comment underlines the need to ensure quality and not just profits. People in the healthcare sector need to publish research and professional experiences as much as other professionals. Abuses also abound in this competitive arena. 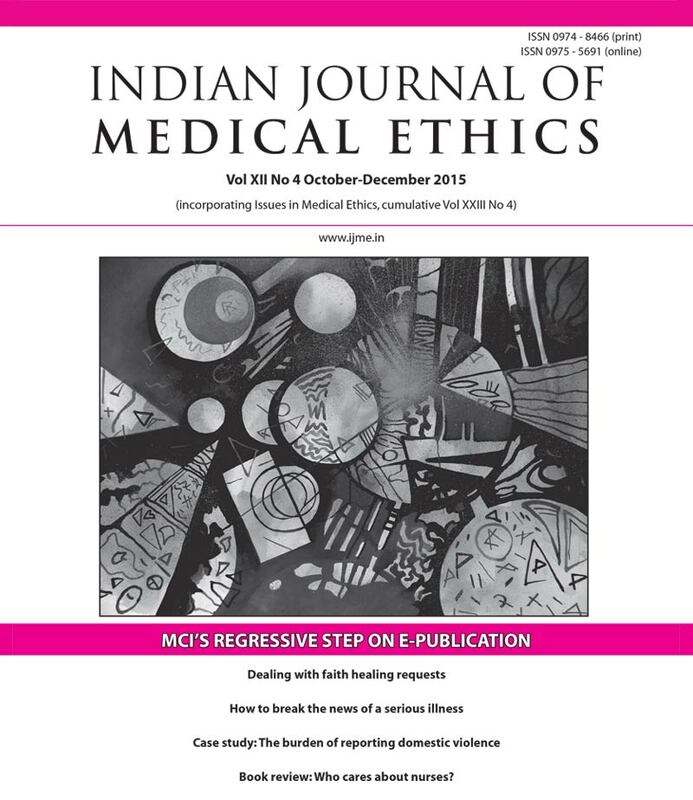 Our editorial argues strongly that a recent MCI directive withholding recognition to publications in the electronic media is a backward step. Internet-mediated psychotherapy: Are we ready for the ethical challenges? The quality of medicines: an ethical issue? Isolation of an individual already treated for Ebola: has India gone too far? The Medical Termination of Pregnancy (Amendment) Bill, 2014 – progressive or regressive?